Quick and easy Vegan Hot Chocolate Recipe made with almond milk. Its the perfect Christmas morning drink or when the weather is cold outside. Made in 20 minutes. Follow this simple recipe to learn how to make vegan hot chocolate. Vegan hot chocolate is one of my biggest addictions! I used to love the feeling of wrapping my hands around a mug filled with hot chocolate as I lay curled up on the couch and watching the snow fall. It was a beautiful site and it had a very calming effect on me. Now, whenever the weather dips here in Florida, I run into the kitchen to make my hot chocolate! There is nothing quite like the first sip of hot chocolate, is there? 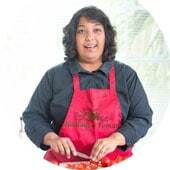 Since I work hard at becoming vegan, I strive to turn my favorite vegetarian recipes into vegan. Making this hot chocolate was definitely worth all those experiments! I used rose water that I had left over from my roasted vegetables recipe and it was HEAVENLY in this hot chocolate. It gave the hot chocolate a slight aroma of roses without overpowering the drink. I don’t think I can ever drink hot chocolate without rose water. The hard part was trying to find the right chocolate. I ended up with (affiliate link) Ghiradelli’s Chocolate Baking Bar. It was really good because it melts fast and tastes great with almond milk. The other option is Baker’s 100% cacao Unsweetened Chocolate Bar. The only caution with that chocolate is that it is manufactured in equipment that uses milk. I prefer chocolate bars in hot chocolate, but, you can also use baking chips or cocoa powder. All of them work really well with almond milk. Speaking of almond milk, you can guess where the almond milk came from, right? Yes, I made it at home in my Nutramilk Machine. It’s so quick, easy and oh so awesome!! 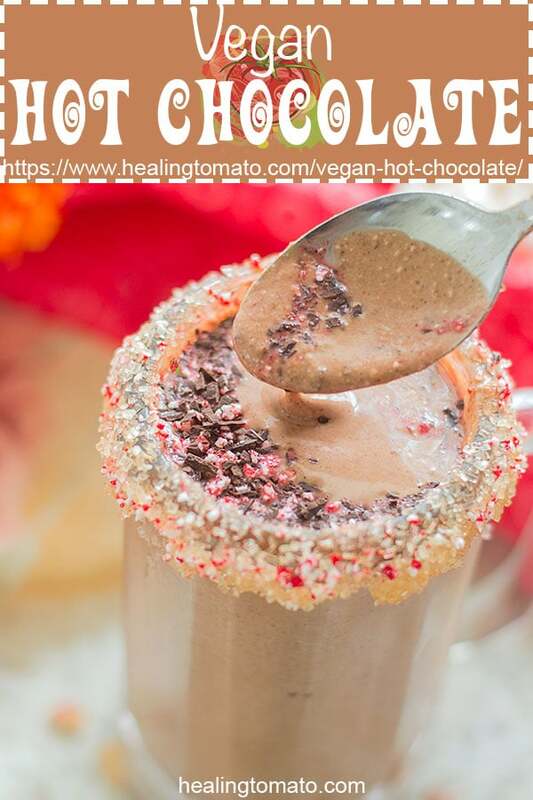 You can use store bought almond milk to make this vegan hot chocolate. It tastes just as good. Make sure you get the unflavored option because you can control the flavors you want in this hot chocolate. I topped it off with shaved cacao and peppermint that I got from crushing candy cane. You can also get peppermint bits online and that will save you the trouble of crushing candy cane. 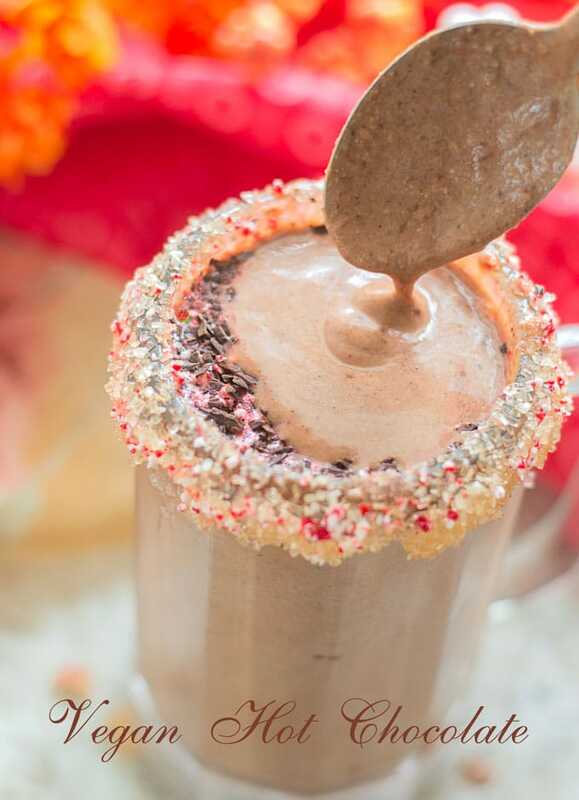 Psst: I also have a boozy version of hot chocolate that you can make at home. Keep it away from the young ones! 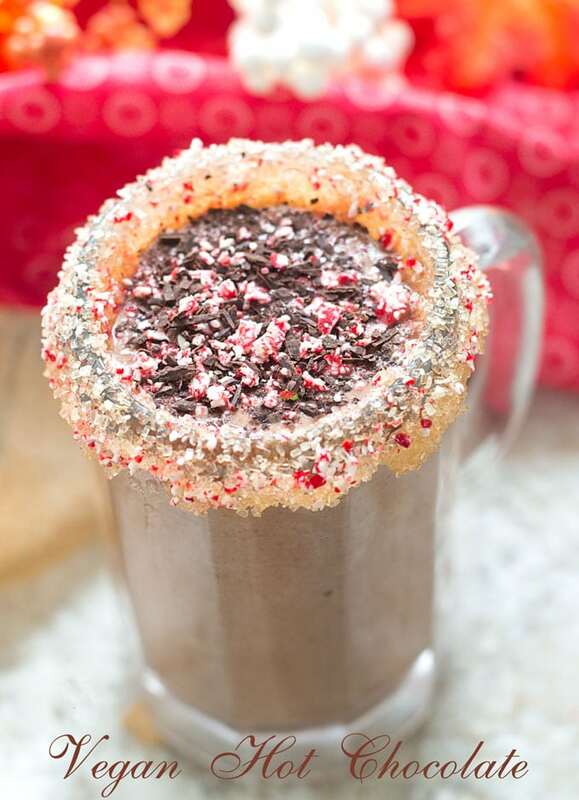 So, what’s your favorite hot chocolate recipe? My goodness, this looks incredibly delicious! Wow this looks amazing! Dairy gives me a hard time but hot chocolate is my fave. I’ll have to try this! 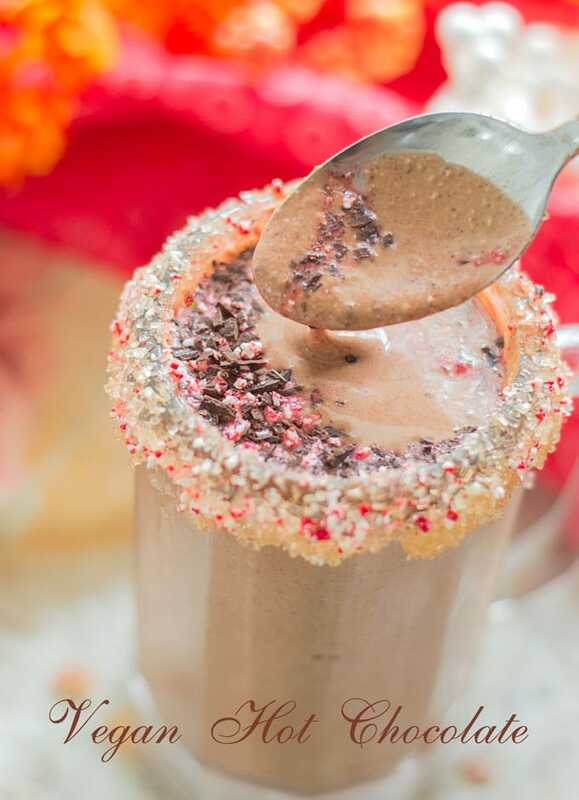 Your almond milk hot chocolate sounds delicious! 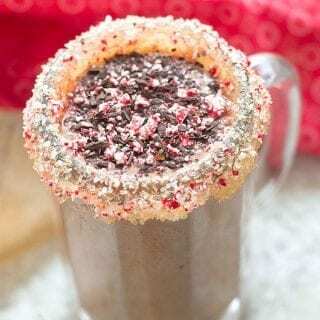 I gotta try this hot chocolate recipe this winter season!!! Love the decoration around the rim of the mug!